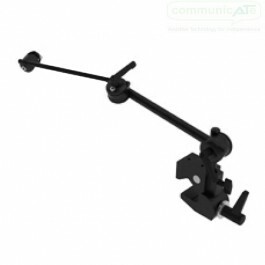 The Monty Control Mounts offer unique "positioning power". Using the versatile swivel joints and quick handles, any switch can be positioned or repositioned with ease. This mount come with the Monty Switch Adapter for AMDI Reflective Bean Sensor (purchase separately), a perfect solution for Sesnor Switch kit setup. With the Superclamp base, the mounting arms can be attached to square edges, like on tables or desks, or adapted for round tube.